This easy banana pudding cheesecake will get rave reviews at your next party or potluck! Rich and creamy with lots of banana pudding flavor, this cheesecake recipe never cracks or curdles – you’ll love it! Banana pudding cheesecake is nothing short of amazing — and we are big banana pudding fans around here. It is creamy and rich like banana pudding but has the tang of cheesecake as well. The cheesecake has a layer of Nilla wafers and bananas, just like the real deal. 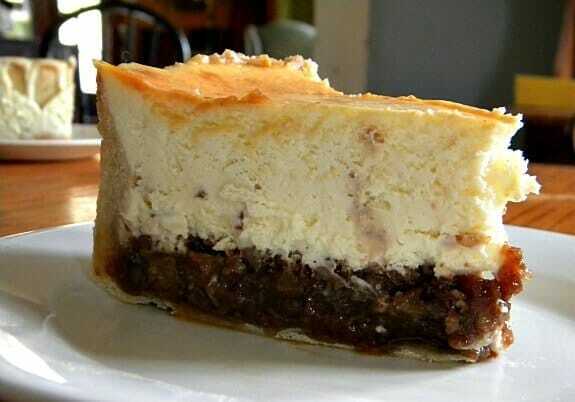 The trick to making a good cheesecake is to make sure that you beat it slowly so no air is whipped into the cheese. It will bake up denser and richer with a much more intense taste. After all, those air molecules take up some space, right? 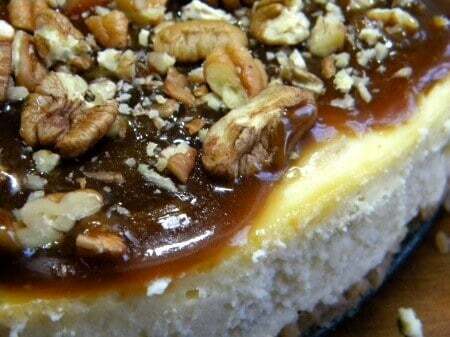 Give this banana pudding cheesecake recipe a try. It’s best if you make it a day ahead of time but you can make it up to three or four days ahead if you want to. Take Southern banana pudding and a New York Cheesecake and put them together -what do you get? This creamy New York cheesecake with big banana pudding flavor. Pour half the filling into the crust. Sprinkle with sliced bananas and remaining (chopped) 'Nilla Wafers. Bring all of the ingredients except the pecans to a simmer. Whisk until the sugar is dissolved and mixture is reduced by half. It should be thickened. 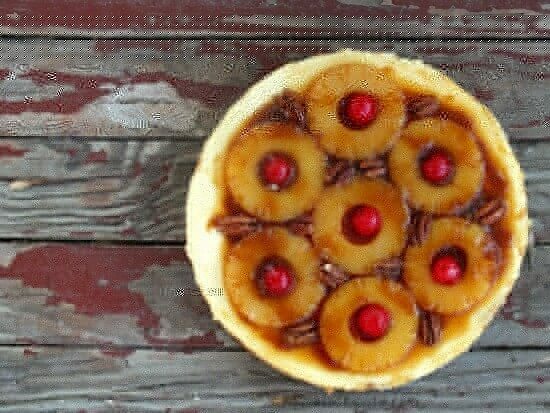 Spread the glaze over the cooked cake, sprinkle on the pecans and press them in lightly. You had me at Bourbon Maple Glaze. Wow. Definitely putting this one on the “Must Make” list. Thank you! Who in world thought that you could improve on banana pudding? Then this doozy comes along! YES!! 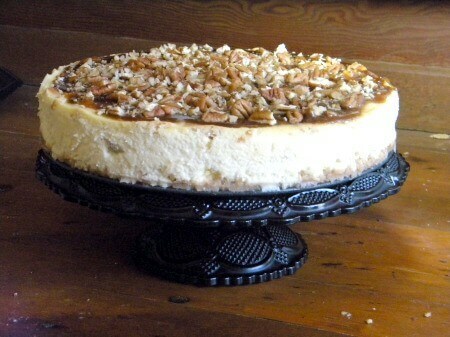 I’m down with banana pudding everything, but your cheesecake may be what I dream about tonight. It looks amazing! Would it be okay to just eat spoonfuls of that bourbon maple glaze by itself? YUM! This entire dessert looks decadent and tasty. Great tip about the secret to a great cheesecake, too! Now THAT looks incredible!!!! I wish I had it for breakfast. Hey, it’s has dairy in it… and pecans… I think it works! Gorgeous, Marye. 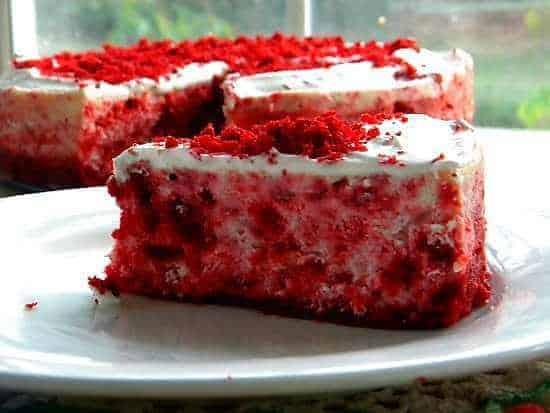 You always have the BEST dessert ideas. 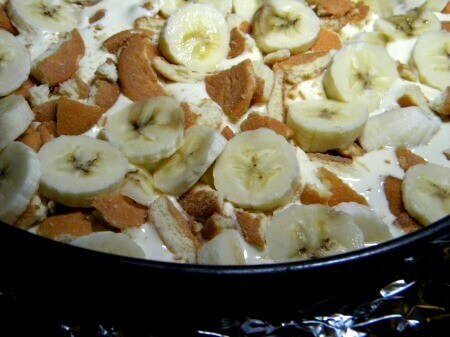 I love banana pudding and cheesecake, and this dessert is one I’d love to make. I CANNOT wait to make this for Easter. All my favorite things together in one dessert–banana pudding and cheesecake! What a brilliant idea. Thanks Lisa. I have to say this is one of my favorites! Stop by the facebook page and share how things went..and pictures!